On Wednesday and Thursday the British currency regained more than 200 points against the USD and returned to the level of 1.6100. Growth was prompted by favourable data on the British labour market. Unemployment rate fell by 0.1% as well as the number of applications for unemployment benefits. Even yesterday’s negative statistics on retail sales was not able to hinder the rise in the pair for long. American news releases will be of interest today: industrial production output and price index for imports and wholesale inventories will become known. 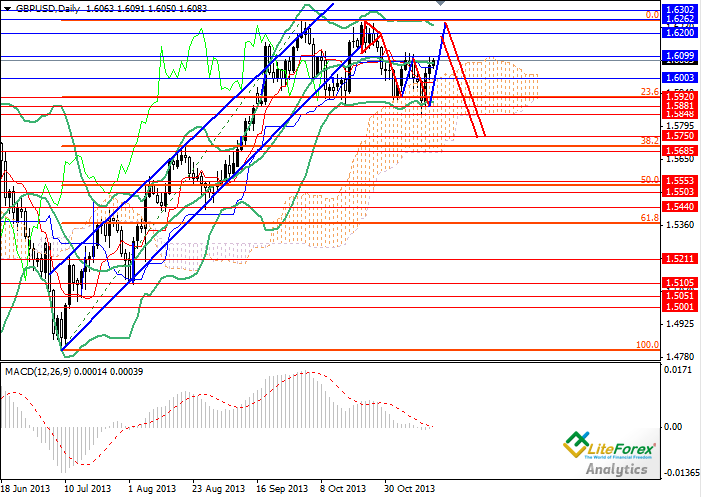 Due to the lack of important British news the pair can slightly correct downward to support level of 1.6000. A lot will depend on the USD: if US statistics does not support the national currency, the pair GBP/USD will soar up to resistance levels of 1.6200 and 1.6260. In the medium-term the Pound will go down. Support levels: 1.6000, 1.5920, 1.5880 and 1.5750. Resistance levels: 1.6200, 1.6260 and 1.6300. In the current situation it is recommended to place pending sell orders from the levels of 1.6200 and 1.6260 with profit taking at the level of 1.5750.